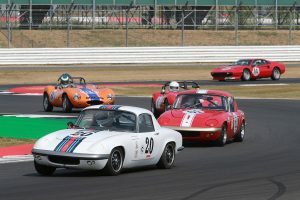 Three categories from the Historic Sports Car Club were on the bill at the Silverstone Classic (20-22 July) as tremendous racing in warm sunshine capped the biggest historic racing festival of the season. With the HSCC team in charge of a very full on-track schedule, the Formula Junior, Road Sports and Super Touring categories all delivered tremendous racing on a weekend that drew 100,000 visitors to the Silverstone Grand Prix circuit. 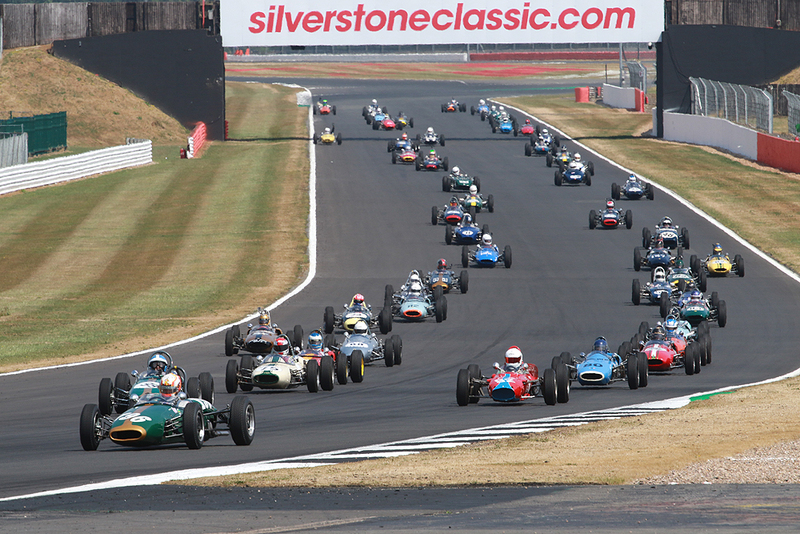 The event included four Formula Junior races as two huge grids each raced twice to wrap up the Diamond Jubilee World Tour in spectacular style. An incredible turnout of 112 cars started qualifying to mark a new category record and there was great racing all down both grids. 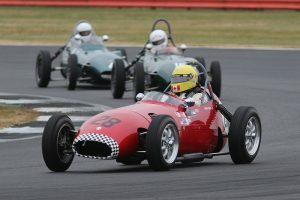 The first race catered for the front-engined and earlier rear-engined cars and wins went to Will Mitcham (U2 Mk2) and Andrew Hibberd (Nick Grewal’s Lola Mk2). In Saturday’s race, Mitcham had to work hard to fend off Chris Drake (Terrier Mk4) and the rear-engined Lotus 18 of Miles Griffiths, which had worked up strongly from 11th on the grid. After dropping to tenth in the opening race after a moment, Hibberd went back to base overnight to re-work the Lola’s set-up and change the springs. It clearly did the trick as he was able to lead from the opening lap on Sunday with Mitcham chasing hard and there was less than a second between them at the flag. Drake battled ahead of Peter de la Roche (Lola Mk2) late in the race to take third with Griffiths back in fifth. The races for the later Juniors were just as good although Sam Wilson (Lotus 20/22) added two more wins to his remarkable tally at this event. It was far from easy in the opener as Tim de Silva (Brabham BT2) and Jon Milicevic (Merlyn Mk5/7) ran Wilson very close while Mark Shaw (Brabham BT6), Benn Tilley (Lola Mk5) and Greg Thornton (Lotus 22) chased. However, the race ended behind the safety car after James Murray rolled his Lola Mk5A, fortunately without injury. Up into an incredible seventh place at the flag was Cameron Jackson (Brabham BT2) after starting 54th and last after throttle cable failure on the first lap of qualifying. He passed 43 cars in the first three laps and would have finished higher had the safety car not appeared. Jackson went back to 54th place on the grid for Sunday and drove an incredible race to get all the way to second behind Wilson, who ran away clear at the head of the race. 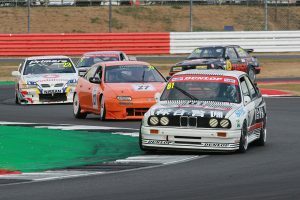 The Super Touring Trophy featured two races, one in a prime slot on the event’s heavily promoted ‘Tin Top Sunday’. Ultimately, James Dodd took a double victory in his Honda Accord but, particularly on Sunday, he was pressed very hard by Rickard Rydell, who marked the 20th anniversary of his BTCC title by racing his old Volvo S40 under the wing of owner Jason Minshaw. In the opening race, Abbie Eaton made a monster start to lead the opening lap in her Holden Commodore but then slipped back to third and was then edged back to fourth in the closing laps by the Vauxhall Vectra of Jason Hughes, which was making a debut in the hands of the former BTCC racer. James Hanson was a class winner in the stunning Jaguar XJ12C of Paul Pochicol and narrowly headed the leading BMW M3 of Tom Houlbrook. Rydell was even more of a threat on Sunday and wriggled ahead of Dodd mid-race before the Honda driver regained the upperhand. John Cleland completed the podium after coming out on top in a battle of the Vectras with Hughes while Eaton posted a late and smoky retirement. 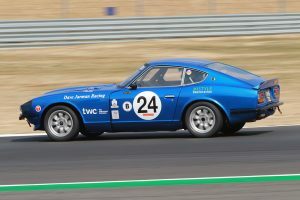 The Road Sports grid for a 30-minute race on Saturday was sensational as competitors from the HSCC’s 70s and Historic Road Sports categories came together for this high-profile event. A capacity field of 58 cars, split evenly between the two groups, delivered battles all the way down the order but no one could match the pace of John Davison, who went steadily clear in his Lotus Elan to take a commanding victory. In Davison’s wake, Richard Plant, Jonathan Edwards and Kevin Kivlochan made it a Morgan Plus 8 two-three-four as the event also marked the 50th anniversary of the Plus 8. Charles Barter was the leading 70s Road Sports runner in his Datsun 240Z but he could never relax too much as Jeremy Clark (Lotus Elan) gave spirited chase and Will Leverett (Lotus Europa) completed the separate podium, finishing one place behind the invitation class Ferrari 308GTB of John Dickson. The Road Sports awards and celebrations were later joined by rally legend Paddy Hopkirk and former Road Sports champion Peter Shaw, while the Road Sports racers also collected an impressive £465 for the marshals’ raffle.